It’s all about braids. Last September, this look showed up all over the spring Fashion Week runways not just in New York but even in Paris at the Valentino show. With the fall shows that just took place in New York and Paris underway, this trend shows no sign of going anywhere. Braids of all varieties went down the runways: There were braided updos, messy ones, sleek ones and even ones that looked a little Princess Leia-like at Marc Jacobs. Other shows where braids had a star turn were Marchesa, Gretchen Jones, Betsy Johnson, Joy Cioci and Rachel Zoe. 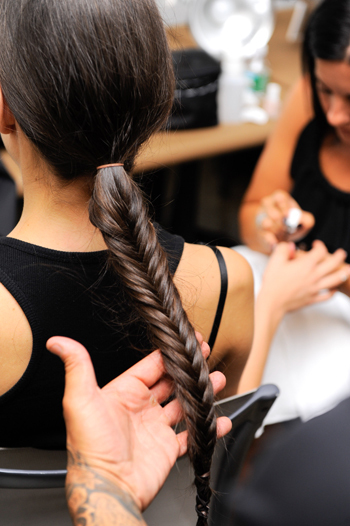 If it’s the fishtail you want to tackle, we have Sebastian Professional stylist Anthony Cole’s how-to from the look he created at Pamela Love’s spring 2012 show last fall. Apply Sebastian Professional Potion 9 to damp hair and blow dry. Create a low ponytail and secure with elastic. Emulsify Sebastian Professional Craft Clay into the palms of the hands to ensure a good grip when crafting the braid. Break the ponytail into two equal sections. Take a 1/4-inch piece of hair from the bottom of one section and pull it out and over, and add it to the other side. Repeat this with the other section and continue repeating this maneuver until the braid is complete. *Expert tip: Use sections of hair larger than 1/4-inch towards the bottom of the ponytail so that the braid does not thin out. Secure the braid with elastic. For a more textured look, run fingers up and down the braid and pull out random pieces. Keep the style in place with Sebastian Professional Shaper Zero Gravity. What glasses work best with your hairstyle?